Over Christmas break, I was determined to do something other than sew. I am not a restful person, and if I'm not doing something with my hands, I default to sewing. I wanted to try and not do too much work while the kids were home. Enter plan B. Work WITH the kids. My son and daughter had been asking for a redo of both their rooms for quite a few months. We decided that this year, instead of buying them a bunch of toys that they would quickly forget about, we would keep the holiday spending to a minimum, and use the bulk of their budget to redo their rooms. On Christmas morning, they each opened one special gift that they had been asking for, and a room makeover related gift. We got that turquoise light string as one of my daughter's gifts. The week of break, we got to work. Here is a lovely before picture of our daughter's room. I didn't even vacuum for you. She lives in what amounts to a walk in closet, on the second floor. By choice. When we moved in, this was the space she selected. "It's small and cozy!" My girl. Our house is a Cape and the upstairs was converted into more living space by the previous owner. So the ceiling in her room slants down to about 2 feet high where it meets the wall. Annnnnnd.....you can see there isn't a whole lot of organizing going on. Or putting away of stuff. Or cohesion. I'm a designer you guys. A designer. Good one. 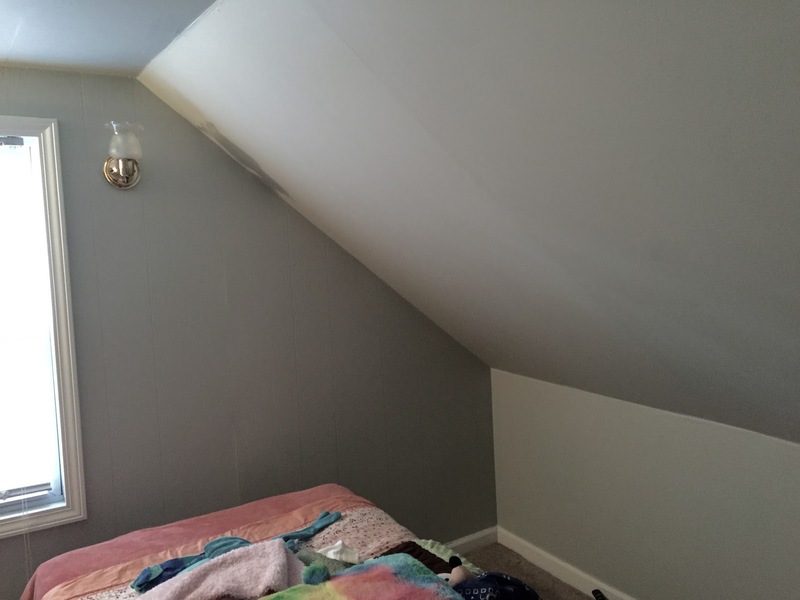 She was forced to choose had picked a lovely soft gray for the walls. (Pause here for a moment and picture what an 8 year old girl wants. She really wanted two walls to be turquoise and 2 lime green or something like that. 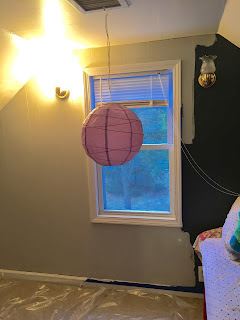 It took some coaxing, but I convinced her to go neutral on the walls and we could go crazy with the accessories) Her walls were already a dark country blue - most of the house is - and while it was completely livable, it made that small space dark. You can see even from this well composed picture that the paint was going to make a huge difference. Oh, and one of the wall sconces? Busted. Found out later there was a dead wasp in there breaking the connection. We're rockstars, people. Seriously, it's a tiny room. I'm standing in the doorway, clicking 1, 2, 3....done. Next, it was time to start shopping! 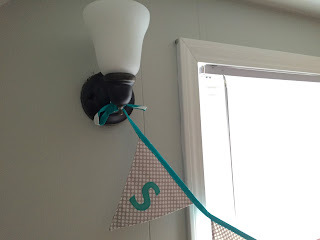 She and Daddy went to Home Depot and bought some updated lighting. And right away, I hung the inspiration piece between the two fixtures. Turquoise, gray, bunting. It's amazing, but such a small thing made such a difference! And then she and I went shopping. She had a pre-determined budget and that was it. I wanted her to feel a sense of ownership over what she purchased and how it all came together. We shopped at places like Home Goods and Target. She weighed her options, looked for deals, picked through clearance bins, and showed amazing restraint if something was cool but not quite right for the room. I was truly amazed! 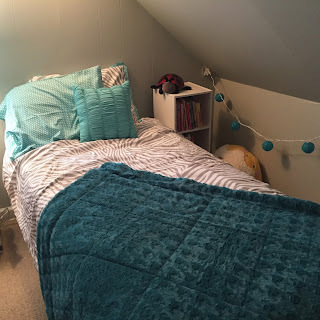 She settled on and purchased a bedding set that included sheets, comforter, sham, and accent pillow all in her colors...a turquoise lamp...and a dark turquoise throw. She asked me to make some curtains with lime fabric we had found and then said that she would ask for some lime accessories for her birthday which was coming up in a few weeks. Bless her heart. 1. Kids can paint. Sure they get some on themselves and sure there were some drips and oopses along the way, but she absolutely loved helping out. And getting her first layer of "work" on her project clothes. 2. Kids can appreciate the value of a dollar. Especially when they are the ones making the decision and they know the budget. Normally when we go shopping, there's a lot of "Ooh, I want that". When she knew she only had a certain amount to spend and once the money was gone, that was all she was going to get for the room, she slowed WAY down. Did the math. Really considered if what she was interested in was worth the money. Calculated how much that would leave for other things. It was a fun process to watch. 3. Having a cohesive and beautiful space makes you want to keep it that way. Reminders about making her bed since the make-over? Zero. She wants to do it, because she loves the way it looks. And so do I! Perhaps I will steal this idea: Make it beautiful - keep it neat. The boy's room is next!